» Archived Review: CHRISTIANNA BRAND – Fog of Doubt. Archived Review: CHRISTIANNA BRAND – Fog of Doubt. 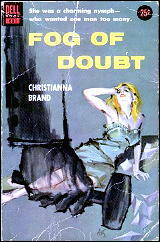 CHRISTIANNA BRAND – Fog of Doubt. Carroll & Graf, paperback reprint, 1984. Hardcover edition: Charles Scribner’s Son, US, 1953. First published in the UK as London Particular, hc, 1952. Earlier US paperback: Dell #881, 1953. On the night of a terrific London fog, a murder is committed, and only a handful people could have done it – excluding the ubiquitous tramp, of course. Inspector Cockrill’s problem is that all of them have alibis and/or no motive. This is supposedly a classic of detection, in which it all comes down to the last line, but in my opinion? I’m not so sure. Either it was a spontaneous crime, a chance opportunity quickly taken, or a devious scheme completely planned in advance. It can’t be both, and as far as I can see, the ending just doesn’t work. The events described are simply in the wrong order. Cockrill has barely any presence in the story at all — I got the feeling the case would have ended exactly the same way, with or without him. The tradition of Christie-Carr-Queen is mentioned on the front cover, but if this is one of Brand’s best, it is easily seen why she’s mostly forgotten today. PostScript: This is the kind of commentary you’re forced to resort to when you don’t want to give too much of the story away, but when the story is essentially the ending, what else can you do? — Reprinted from Mystery*File #35, November 1993, somewhat revised. [UPDATE] 05-15-10. What this kind of negative review on my part makes me want to do today is find my copy of the book and read it again, especially since the author is still well regarded today. I seldom pan a book as severely as I did this one, so what I’d really like to know now if it’s really as bad as I thought it was then. Did I read it wrong? Was there something I missed? I don’t know, and I wish I did. [UPDATE #2] 05-17-10. I’ve just posted Marcia Miller’s review of Green for Danger, one of Christianna Brand’s earlier mysteries (1945). I mention this because I quoted from her review in my Comment #2. 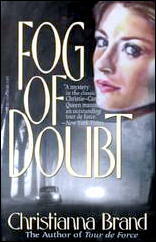 I’ve also belatedly discovered that Kevin Killian reviewed Fog of Doubt here on the blog about a year and a half ago. He goes much further into detail about the plot, finds some of the same problems with it, but overall he liked the book much more than I did. Follow the link, and you’ll see what I mean. Much as I loved GREEN FOR DANGER, overall I’ve found Brand uneven. There was too little of Cocky in this one, and it didn’t feel like her at her best. Barzun and Taylor weren’t too fond of her work either with the great line that TOUR DE FORCE suffered from a ‘bad case of cousins.’ This one just didn’t strike me as first rate Brand when I read it, but maybe I should give it another chance. I think it’s time to give it another try myself. At the time I wrote this review, I was reading plots very carefully to make sure they held together, so I may have been overly critical for that reason. Which agrees with the impression that you and I both received about him, David.